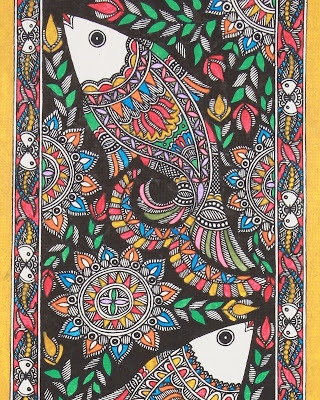 Madhubani art is a style of painting from Mithila region of Bihar in India. Earlier these paintings were made only on the occasions such as wedding ceremony, vratas, and pujas. Designs depict the occasion of celebration and seek divine blessings. 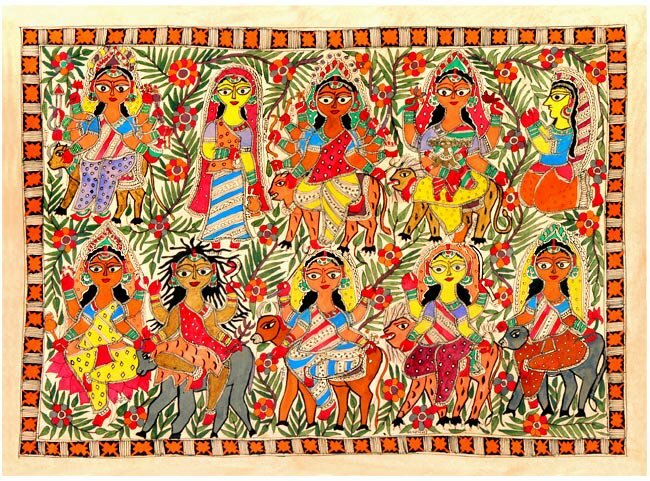 This art is mostly practised by women in villages of Mithila region. 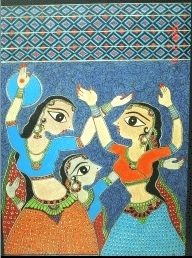 Origin of this style of painting dates back to the period of Ramayan. 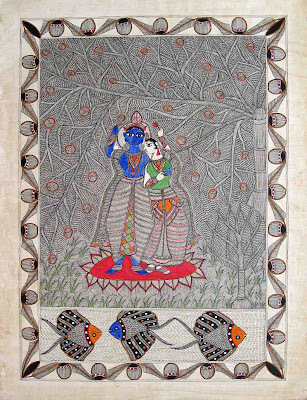 It is said that Mithila is the birthplace of 'Sita' and at the time of her marriage with Ram, King Janak commissioned artists to do this painting. Buddha and Mahaveer can be seen in Madhubani paintings as celebrated figures. It is an age-old art form and is prevalent even today. In it's earliest form painting was done on floors and mud walls using natural dyes. These days artists use fabric or paper and acrylic/poster color for painting. The painting was mainly done by women of Brahmin and Kayastha castes and art form is handed down from generation to generation. This painting style uses two dimension imagery. Paintings mainly depict mythology and day to day life. Paintings done by Brahmin and Kayastha women were more sophisticated and were based on Hindu mythology whereas Madhubani painting done by Harijan women were less sophisticated but were well expressed. Painting style mostly depicts Hindu deities and natural objects that show fertility and prosperity like sun, moon, fish, parrot, elephant, turtle, lotus, bamboo tree, tulsi plant, flowers, birds and animals. In this style of painting, deities are positioned centrally and then no space is left around the main figure. Gaps are filled by drawing flowers, birds, animals and geometric designs. 2) Bharni: Solid colors are used to fill the picture. The process of making this painting is very simple but involves a lot of patience. In an earlier form, the painting was done on floor and wall by plastering cow dung on wall/ floor and then picture were made with rice paste and natural dyes were used to fill color in the painting. These days it is done on fabric and paper. So artists mainly use acrylic color or poster color. The first step is to choose the theme of the painting. The design is then traced on fabric/paper. The outline is done in black color and generally, a double line is drawn then it is filled with delicate fine lines or color is filled if the painting style is Bharni. 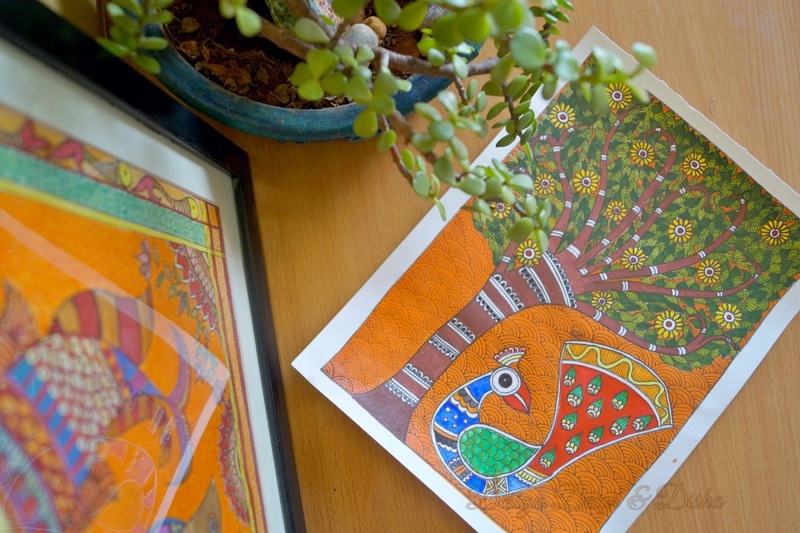 Though Madhubani is an age-old art form but it received recognition in 1970 when an artist Jagdamba Devi from Mithila was awarded by Indian President. One such renowned artist is Bharti Dayal who has been awarded National award and various other awards also. The second image in this post is her artwork. 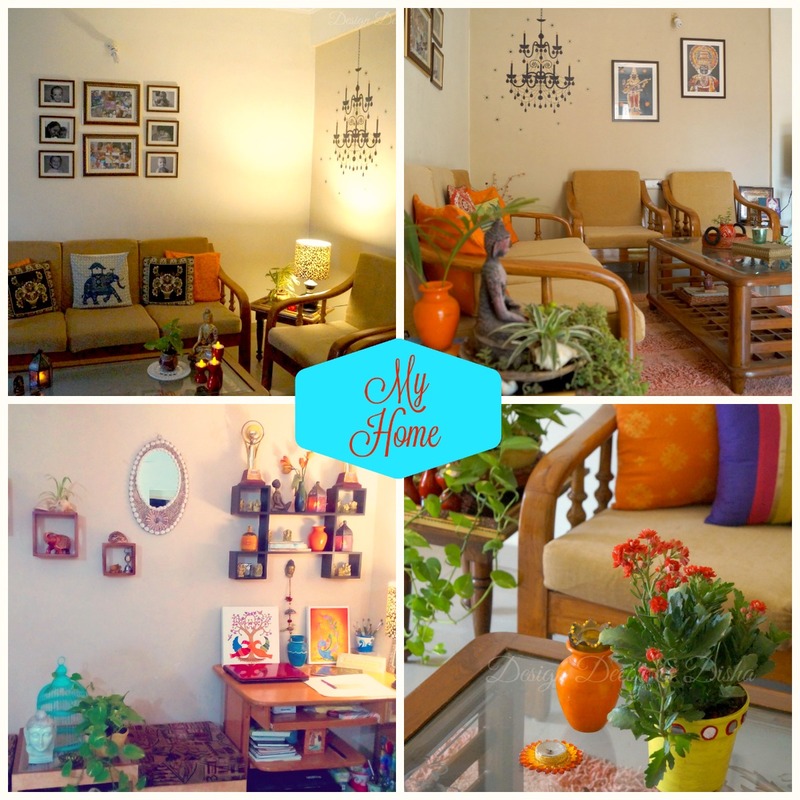 Her artwork is a perfect blend of heritage style and contemporary work. Her paintings will be exhibited at the World Conference of Religions in Brussels in 2014. A big Salute to all these women who are trying to keep our heritage and art alive and are a pride of our Nation. Here is the Mithila Painting that I made especially for a video tutorial. 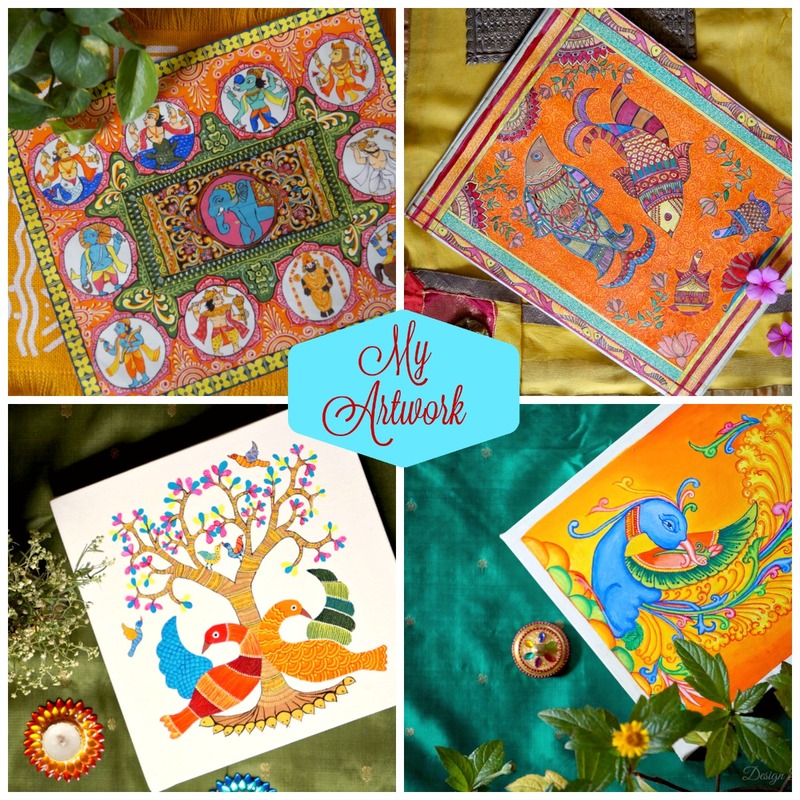 Here is a requested video tutorial on "How To Paint Madhubani painting" for you all. 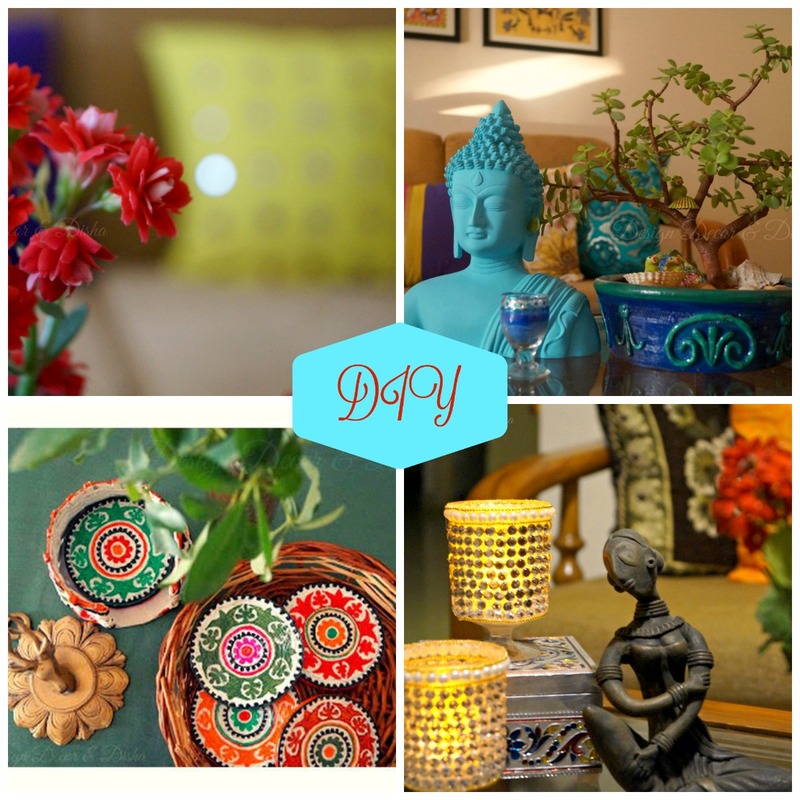 Hope you loved knowing about this beautiful Indian art form!! See you soon with something new till then connect with me here. 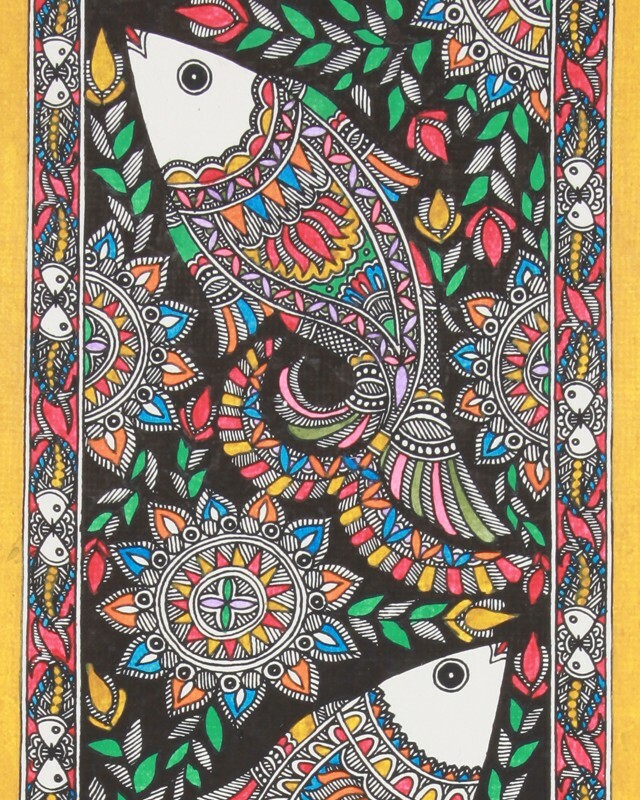 Madhubani paintings are always so colorful...and love all the details in 'em. This such a nice post Disha.. Detailing is the essence of this art Nayana isn't it!! Thanks and I'm glad that you liked it. these are such beautiful works of art!! Thank you for sharing these cultural styles and history Disha.